Physical fitness therapy can help with a variety of ailments and conditions, not just addiction recovery. However, when rehab centers include physical therapy in their treatment plan, it can target specific health issues, emphasize the results of recovery, and pump up endorphins in a natural way. As a result, patients feel energized and experience a new kind of high that does not hurt them or their close ones. What Does Exercise Do to the Brain? Numerous studies show that exercising improves the brain’s cognitive functions. Exercise boosts memory and attention while also helping the brain react quicker and resolve complicated tasks. In a way, by exercising your muscles, you are also exercising your brain. Not only that, but physical activity also enables the body to release endorphins, lower anxiety levels and other issues associated with anxiety, such as depression or stress. By keeping a stable mind, patients can decrease the triggers that might make them want to pour an extra glass of wine or exceed the recommended opioid dosage. People are less likely to engage in any unhealthy activity if their body is active and feeling well. 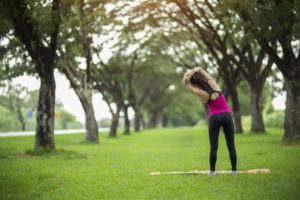 How Is Physical Fitness Therapy Used in Addiction Treatment? When it comes to addiction treatment, rehab centers don’t use physical therapy in the traditional sense. Patients don’t necessarily need to hit the gym during their recovery – unless that is what works for them. In most cases, physical fitness therapy consists of outdoors activities such as hiking, rock climbing, swimming, or even dancing. Fitness can mean anything that keeps the patient moving, elevating their heart rate. Rehab centers with a holistic approach to drug recovery include these activities in their adventure program and customize them to meet the unique needs of their patients. What Are Other Treatment Options Used in Combination with Fitness Therapy? Fitness therapy is just a small part of a bigger program that targets addiction and substance dependence. A lot of rehab centers have come to realize that a holistic approach that relates to multiple parts of a patient’s life is the key to a successful and lasting recovery. As such, they combine fitness with individual and group therapy and other programs that focus on mindfulness and creativity. Expanding their universe and range of activities will help patients stay busy, active, and social, thus keeping their mind away from drugs or alcohol. Another advantage of physical fitness therapy is that centers can combine it with almost anything since it does not interfere with any theories or practices. It simply strengthens the body and the mind and makes the person ready to receive the treatment. Staying active during and after recovery is paramount. Physical therapy provides a sure path to a healthy body while also making the mind sharper and less anxious. Fitness should be added to any treatment plan – it doesn’t have to be weight lifting or cardio, it can be any physical activity that brings pleasure to the patients. In order to encompass the larger collection of effective solutions for addiction treatment, we are continually adding new and innovative therapy methods. The reason why we keep pushing the boundaries is that our therapists want to offer you options on the cutting edge. Traditional addiction treatment methods like physical fitness therapy go along well with more innovative treatment (and holistic) approaches. Physical fitness therapy can actually speak to the fundamental causes underlying a person’s substance abuse. Human beings are meant to be active—not just sit around and get high all day. Our blood needs to flow and our hearts pump! Windward Way has just the exciting programs available like our totally unique adventure program and ropes course therapy to give young men the challenges they’re looking for. Find your solution right now! 855-491-7694. Within our extensive drug and alcohol rehabilitation programs, our staff often takes advantage of physical fitness therapy as one particularly effective modality to begin to heal a man’s substance abuse. Since our professionals want to target the source of a person’s behavior, we see each individual as a collection of many parts comprising a whole person. It is precisely this “holistic view” of substance abuse treatment that is so beneficial to not just address the substance use itself, but also get at the foundations that build a man’s attitude toward life. Windward Way also believes that finding the fun in recovery makes our program shine brighter than the rest. Take a moment and call today. We’ll customize a treatment strategy just for you. Rediscover yourself, the Windward Way. 855-491-7694.